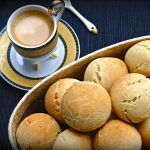 I am sharing with you today another Portuguese bread that emblematic of Portuguese gastronomy: broa de milho. 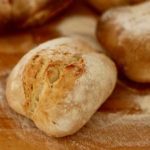 This traditional Portuguese bread is a typical bread from the northern region of Portugal, where maize cultivation has always been important but it is also very popular in Galicia (Spain) and Brazil. 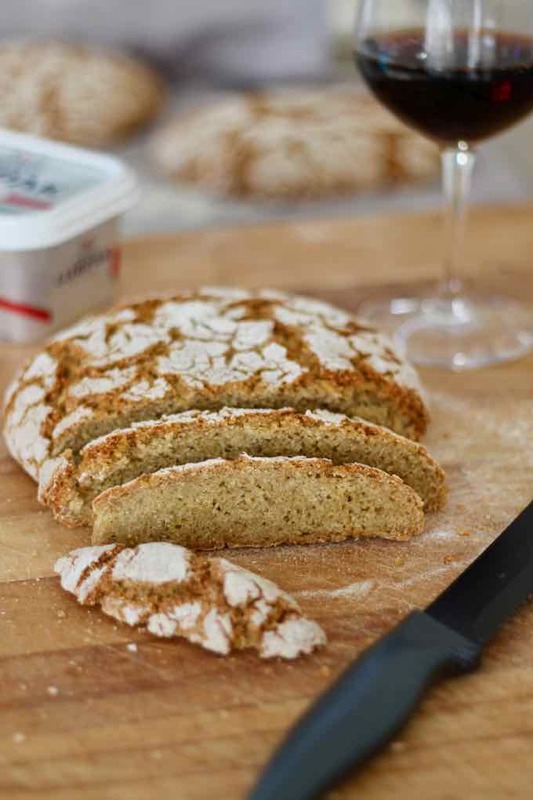 Broa de milho is made mostly with maize flour, as well as rye flour and some all-purpose flour, but it can also be made from maize flour only, which will make it heavier. Broa de milho has a round shape and is slightly flattened. It has a hard crust with characteristic cracks on it. Its crumb is compact and it keeps for a few days. Unlike the version from Portugal, the Brazilian version has a crust that is less hard and a crumb that is less dense. 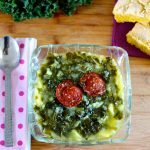 This corn bread is an excellent accompaniment to soups such as caldo verde or açorda but can also be served with olives and/or butter. The traditional corn bread is prepared with natural yeast, just like pão alentejano and is slowly baked in a wood oven, giving it a different and unique flavor. Not everyone has the chance of owning a wood oven at home, so your standard electric or gas oven will do the job just fine! 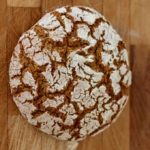 Today, I am sharing with you the simplified recipe with standard baker’s yeast, but nothing prevents you from preparing it with natural yeast. It will be necessary to prepare the natural yeast for your broa de milho 12 hours ahead from a mother dough. When Europeans discovered America, corn was already growing from north to south, from the St. Lawrence river in Canada to Rio de la Plata in Argentina. The first introduction of maize into the Old World, in Europe, Asia and Africa, would be once again thanks to Christopher Columbus. Yes, the first ears of corn arrived in Europe with Christopher Columbus in 1493. But they were introduced to Portugal only around 1515, thanks to Diego Columbus, son of Christopher Columbus and Filipa Moniz, Portuguese by birth. Unlike the Spanish, the Portuguese introduced maize very quickly into their food and even spread it over all the lands of the Atlantic, India and the Pacific, as well as in Portuguese America. Note that it is the Portuguese who have helped maize surpass global wheat production. According to several authors, it is on a Portuguese boat that the word broa appeared. The first recipe of broa de milho dates from the 12th century. which means “bread” in both languages. Gothic is a dead language that was spoken by the Goths in the Middle Ages. It belongs to the Germanic branch of the Indo-European language family, just like the Celtic languages. In Galician, on the other hand, it is called boroa, a term also used in Portugal during the Middle Ages. The word broa is mainly used by people from northern Portugal. 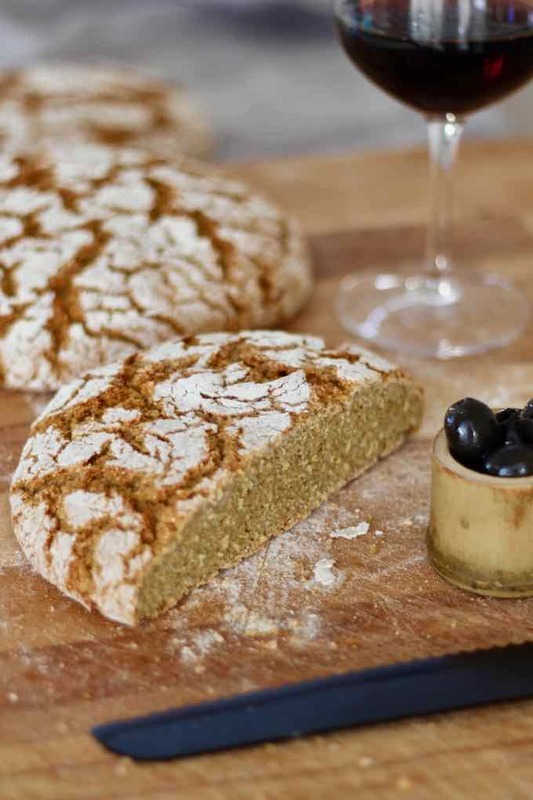 In the south of Portugal, who are larger consumers of wheat bread due to the great Roman influence, they have adopted a name that derives directly from the Latin panis: pão. In 1417, in a document kept at the Institute of National Archives (Instituto dos Arquivos Nacionales) of Lisbon, Torre do Tombo, broa de milho is defined as the “corn bread used by the poor”. It was the daily bread of the people, because only the rich benefited from wheat. It was not until the twentieth century that broa de milho became the bread of all people. On the Brazilian side, there are several versions as to the origin of the word broa. But, one of the best known versions is that the word broa would be a Brazilian adaptation of the word “bread”. For several hundred years, Native Americans have called it “my mother, my life” as corn was so much present in their diet. As it was cultivated with squash and beans, this trio was called “the three sisters”. The history of corn begins 9,000 years ago in Mexico. A local plant, teosinte, was cultivated by early Amerindian civilizations. Teosinte was a plant adapted to the tropical and humid climate. The harvested grain was then crushed to obtain a flour that was consumed by local people. The domestication of maize was a real “green revolution” in ancient times, and this happened by modifying very few genes of teosinte, the wild parent of maize. A recent study has established that these “genetically modified” products are perhaps older than we think and would date back to prehistoric times. By comparing the genetic heritage of maize found in the old Mexican and American establishments, with those of 66 breeds still cultivated by the Amerindians, it turned out that the few genes needed to transform the teosinte into “real corn” were already present more than 4000 years ago. This means that the domestication of teosinte and its transformation into maize occurred a few thousand years ago (probably about 5000 years ago), because the genetic structure of the cultivated plant was already “fixed” at the time of cultivation of the first grains. The evolution of teosinte happened both naturally by genetic mutations, but also and mostly by humans through massal selection. In fact, Native American farmers voluntarily chose the seeds of the best plants to preserve and sow them the following year. Thus, the grains were gradually selected by the farmers. The success of corn is due to its ease of cultivation and its yield, which is higher than that of other cereals. In the twentieth century, man adapted it to more northern growing conditions, thanks to early varieties; yields then quadrupled in 25 years. Today, maize has become the first cereal grown in the world, ahead of rice and wheat. Harvested in grains or with the whole plant, corn is widely used in animal and human foods, and for industrial uses. To prepare broa de milho, people use corn flour, which is widely used in Portugal. Corn flour is a granular, slightly yellow powder (it can be white too) obtained by grinding corn kernels. Corn flour should be differentiated from cornstarch. The first is made from whole grain corn while the second, much thinner, uses only the starch from the maize. 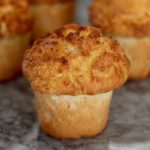 Corn flour is also very popular in the United States, especially in the southern states, as it is the base of the traditional cornbread. In Mexico, maize flour (masa harina), this time nixtamalized, is also very popular as it is used to make tortillas. 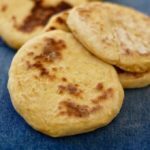 These small thin flat breads that are usually garnished with vegetables, meats, fish and spices take the names of tacos, burritos or enchiladas depending on the recipe. Finally, Italy is also fond of corn flour, or rather corn meal (coarser corn flour) which is used to prepare the famous polenta. Few people know that corn grain is an exceptional natural supplement: it contains vitamins (especially Vitamins B) and has a high content of minerals such as iron, phosphorus, magnesium, potassium. It also contains calcium, copper, zinc and selenium. Thanks to the potassium salts, corn is also a good diuretic and contributes to the elimination of uric acid and phosphates. Corn is very rich in vitamins: the vitamin intake is composed of beta-carotene, a precursor of vitamin A, and vitamins B1 (thiamine), B2, B3, B9. Corn also contains small amounts of vitamin E. Thanks to thiamine, corn is a food that rebalances the nervous system. It also provides folic acid and for this reason corn intake is recommended during pregnancy. The folic acid and iron that it contains also protect against anemia. Corn also has a good amount of lutein, a flavonoid that has a protective effect on the eyes and is effective in preventing age-related macular degeneration (AMD). And, very importantly, corn is completely gluten free! And because of this, it is very easy to digest. It is essential for people who are gluten-intolerant and for diabetics because, compared to other cereals, it does not cause a rapid increase in blood sugar. Studies show that corn has an anti-cholesterol action but its most effective function is the depurative function on the liver and the intestine. Yes ! Corn is all of that! We enjoyed this excellent broa de milho for a breakfast with friends on the sand of an Israeli beach. Everyone chose their side between butter, olives, olive oil, several cheeses, and there was even a fatouche salad, this excellent salad of Lebanese cuisine, that is also very popular in Israel. I urge you to test this recipe very quickly! 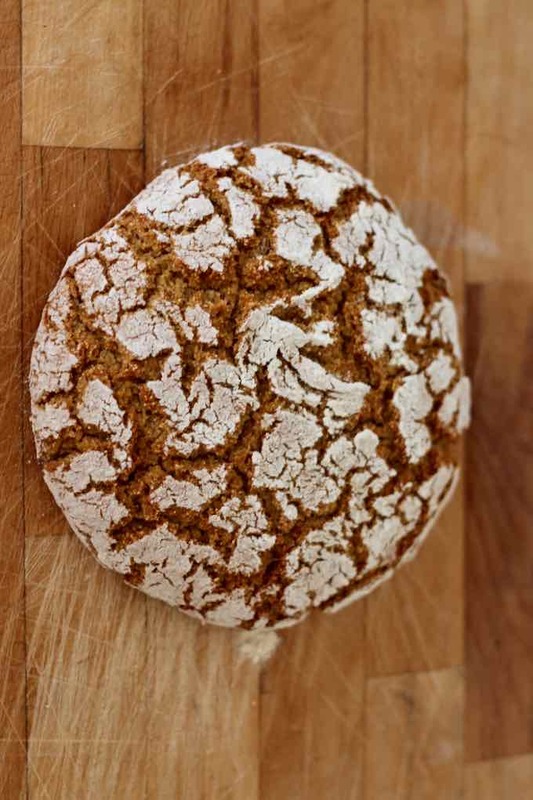 Broa de milho is a delicious bread that is typical of the northern region of Portugal. 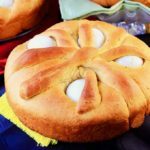 It is usually prepared mostly with maize flour, as well as rye flour and some wheat flour. In the bowl of a stand-mixer, mix the corn flour and the boiling water and knead by hand for one minute so that all flour is moistened. Cover and let stand for an hour. It is important that the temperature of this mixture is less than 85 F before starting working it again. 15 minutes before the end of this resting time, mix the yeast and warm water and set aside for 15 minutes. Mix the yeast and water with the moistened corn flour and knead for 3 minutes using the flat beater. Add the rye flour and knead for 5 minutes, still with the flat beater. Switch with the dough hook and, gradually incorporate the all-purpose flour while kneading. You should get a smooth, sticky dough that is not difficult to work with. When you get this consistency, you have to stop incorporating all-purpose flour. Add the salt and knead for 3 minutes. Cover with a cloth and let the dough rise again for 45 minutes. Dust the work surface very generously with all-purpose or rye flour. Form one or two large balls and flatten them very slightly. After 40 minutes of baking at 400 F, lower the temperature to 350 F until the end of baking. Cornbread with soup! My favorite! Lovely recipe! This turned out with a very, very hard chewy crust. Almost inedible. When I finally could saw my way through the crust it mostly fell off. The interior was moist enough, but it wasn’t able to be sliced to eat. Any thoughts on what went wrong? I followed the directions exactly. It’s hard to tell Sandy, as it could come from a number of different factors. This exact same recipe worked fine for us.